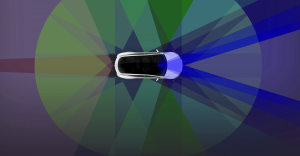 Tesla Will "Enable Full Self-Driving Features" in August. Here's What That Actually Means. This will probably not be the last summer you have to drive yourself to the beach. Have a problem with your vehicle? Maybe a local mechanic can help fix it. If you own a Tesla, though, you tweet company CEO Elon Musk — and if you’re lucky, you get a response that not only answers your question, but also includes a major announcement about the future of transportation. Wait, what?? Does that mean, in just a couple of months, we’ll be able to kick back and let our cars do all the driving for us? For one thing, Musk’s language in the tweet is pretty vague, and right now, it’s all we have to go on — a Tesla spokesperson told The Verge the company had no further comment. Every Tesla reportedly already has all the right hardware for full self-driving, so that’s a non-issue. And its autopilot already works, albeit not perfectly, as long as a driver is still able to take over if something goes wrong. But which self-driving features will the company enable with the V9 software update? Other than an improved ability to merge, we don’t really know. And presumably, we’d need all the self-driving features enabled to actually, you know, let the car drive itself. Still, even if Tesla enabled every full self-driving feature on August 1st, that doesn’t mean 2018 will go down as the last summer you had to drive yourself to the beach. “Vary widely” is right. In the U.S., 29 states plus Washington D.C. have some sort of legislation on the books with regards to self-driving cars. That leaves 21 states with nothing at all, and then there are all the other nations of the world to consider. Within the U.S., even states most supportive of self-driving car development, such as California, require manufacturers to apply to test their vehicles on public roads. If that gets approved, they still have to remotely monitor any vehicles operating without a human driver behind the wheel. No one can say for sure how long it might be before the entire U.S. (and the rest of the world) allows any owner of a self-driving car to let the tech completely take the wheel. But we might be one step closer to that tantalizing future by August.